In the early 1800s, the British government, motivated by profit and security, marched into the Southeast Asian nation of Burma, also known today as Myanmar. A Buddhist country rich in natural resources, Burma was an expansionist power that bordered India, one of Great Britain’s most prized colonies. Three Anglo-Burmese Wars were fought over a period of 60 years and Burmese territories were annexed as provinces of British India before the British government allowed Burma to be administered separately in 1937 (Harvey, 1946). In 1948, Burma finally gained its independence but the presence of the British colonists had inevitably transformed the nation, its government, society, and institutions. The education system in Burma was one of the areas in which profound changes had taken place. How did British colonization transform the Burmese education system during the mid-19th to early 20th centuries and how did nationalists respond to these foreign influences? In the pre-colonial period, education and religion were inextricably linked as the Theravada Buddhist monastic order, or the Sangha, served as the main educational institution for the natives. After Burma was colonized, the British attempted to reform the existing system, initially by working to incorporate more secular subjects into the monastic curriculum and later by setting up a system of secular schools that could supply them with local administrators and civil servants and enable them to “civilize” the Burmese people. With the rise of the nationalistic spirit in the 20th century, the educated Burmese demanded education reforms and created national schools that endeavored to rebuild a sense of national identity. 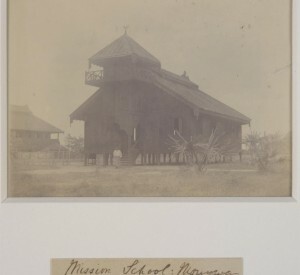 Prior to the arrival of the British, few private schools existed except those established by Christian missionaries and local monasteries in the self-contained agricultural villages were the center of culture and served as schools for the Burmese boys. Due to religious restrictions set against women, girls were educated at home by parents who taught them basic literacy skills alone with other skills related to efficacy in home duties and at the marketplace needed for business activities (Cady, 1958). The emphasis of monastic education was placed largely on learning and reciting religious Pali scriptures that would help the boys develop skills required to eventually monks (Fuqua, 1992). The strong connection between religion and schooling is reflected by fact that the Burmese word for school (kyaung) is the same word used to refer to the monastery.Though the education was of a religious nature, the monastic schools ensured that Burma had a high literacy rate of about 60% as the majority of Burmese men were at least able to read and write their basic letters (Harvey, 1946). The monastery schools were completely independent from government control and Buddhist monks, in addition to carrying out the duties of their office, acted as the schoolmasters, teaching the basics of reading, writing, and arithmetic. Their work was supported by voluntary gifts, donations, and alms from the villagers, allowing the monks to provide education free of charge to all boys in the village regardless of their class or religious background (Octennial Report, 1956). Some boys attended the school in the day and went home at night while others temporarily became novices for a period of time and lived at the monastery. Rather than using exams or grades to categorize the boys, the monks grouped boys instead by lessons they had completed (Octennial Report, 1956). The main issue in these village school systems, however, was that attendance was irregular and some students dropped out after just receiving the basic literacy skills as working in the fields took precedence over going to school. In addition to teaching students the basics needed for literacy, the monastic education aimed to transmit the traditional cultural, moral, and religious values of the community and society (Cady, 1958). The monastic education system also contributed to the leveling of classes in society as entrance was open to all and regardless of whether one was a prince or the son of a poor farmer, everyone enjoyed the same status and was subject to the same discipline (Cady, 1958). A more advanced level of education that addressed a wider array of subjects, such as Buddhist Studies, Classical Burmese literature, court protocol, engineering, construction and manufacturing operations (Cady, 1958) could also be attained at some monastic centers in urban locations. 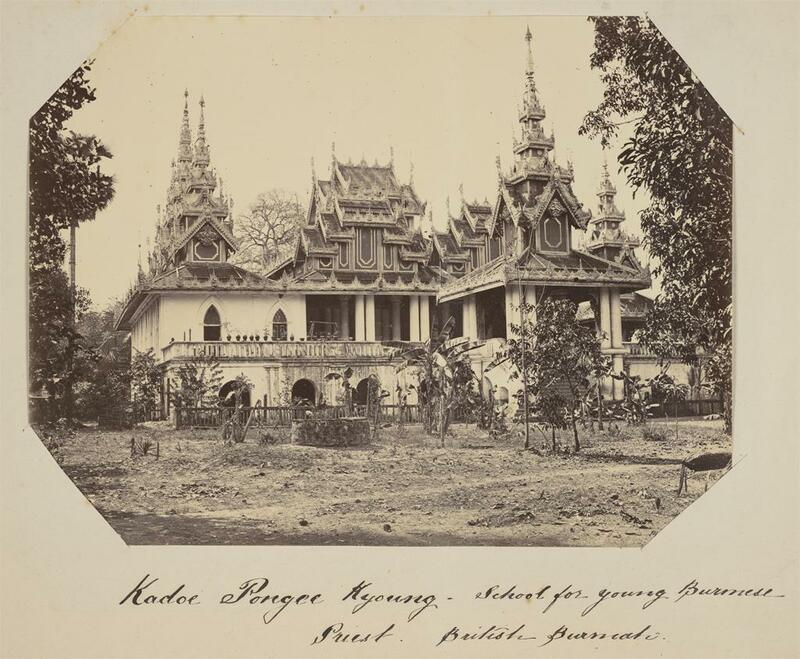 This education enabled those who would become monks to build pagodas and monasteries and for those who didn’t to fill roles in the Burmese court. Aside from monastic schools, a few other avenues of education were also available to the Burmese males. Vocational education was learned in a hands-on manner with students taking up actual apprenticeships (Harvey, 1946). The Burmese kings also sent men to Calcutta and attend higher learning institutions to acquire other sorts of training in the medical or technical fields (Furnivall, 1948). Prior to 1854, the British had a laissez-faire policy in regards to education. The British had a policy of conciliation since the early 19th century and to avoid confrontation with the local population they did not try to change the education system which was linked to religion (Fuqua, 1992). However, as mentioned before, western education schools had already been established by Christian missionaries in the rural areas populated by Non-Burman ethnic tribes, such as the Karens, Kachins, and Chins. While the missionaries’ efforts with the Burmans and Shans, who were devout Buddhists, were met with resistance, they successfully educated some of the minority groups and also converted them to Christianity. These schools educated both male and female students. The efforts of the American Baptist mission schools, for instance, were so successful with the Karen that they eventually established a college for them in the city of Rangoon (Cady, 1958). 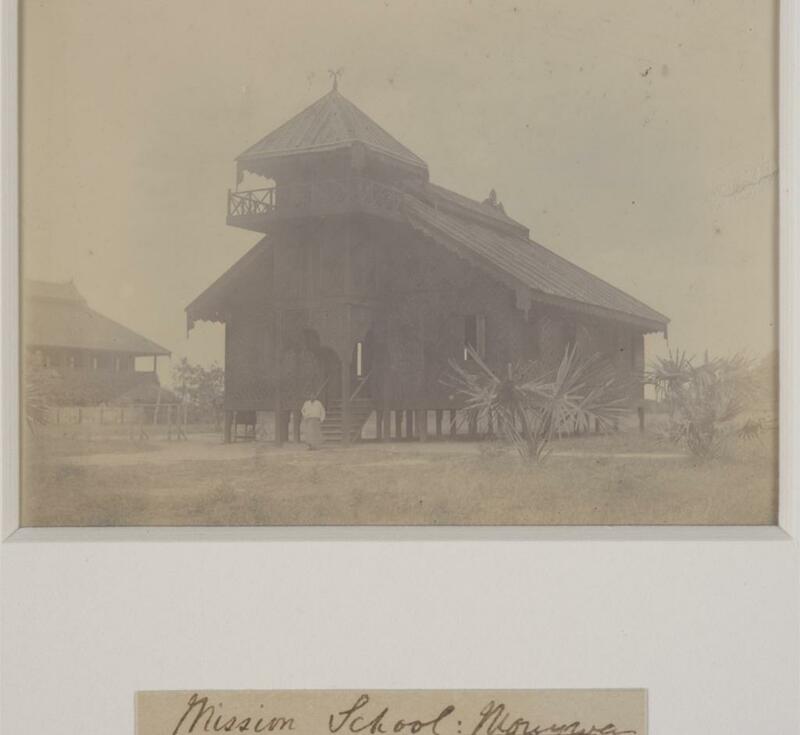 These mission schools were an effective means of educating rural populations living in areas that were hard to reach due to geographical barriers, even after a formal school system began to emerge later. Starting in 1854, the British authorities extended their influence into the education system. Their aim was to “convey useful and practical knowledge suited to every station in life to the great masses of people” as well as to “spread civilization” to remove superstitious prejudices (Fuqua, 1992) . Aside from their liberal and humanitarian sentiments, they also hoped to use education to attach subjects more closely to British rule (Furnivall, 1948) and needed natives who were literate and fluent in English to fill the positions as local administrators and subordinate civil servants (Hillman, 1946). Though they had already opened three Anglo-vernacular schools between the period of 1885 and 1844 to educate English-speaking clerks, there was little demand for these schools because fewer positions in government work was available at that time and most people continued going to monastic schools. Initially, the British attempted to use the existing monastic system to fashion a rudimentary system of western-style primary education. As this was prior to the separation of Burma from India, this simply resulted in the imposition of educational policies in India on the Burmese system. It fell upon Sir Arthur Phayre, the Commissioner of British Burma to combine the best of both worlds and incorporate secular subjects into monastic system to create a westernized system similar to what was established in India (Fuqua, 1992). However, Phayre’s attempts failed because they were resisted by the monks and they failed to take into accounts the differences between the Indian and Burmese population. Although a few monasteries were receptive to the idea of improving their curriculum and accepted secular textbooks from the British, most monasteries resisted the change. Monks refused to teach subjects like geography and science which they considered to be evil and “refused to play the layman, to be supervised by the layman, to keep lay attendance registers, to exercise lay discipline, and to use lay books” (Campbell,1946). Although their resistance was in part due to religious reasons, it is also likely that they were reacting to being “systematically disenfranchised by the colonial state through its demolition of the pre-existing Buddhist political order” that was closely associated with the Burmese monarchy in the pre-colonial era(Cheesman, 2003). Phayre’s efforts also failed because unlike in India where there was “no comprehensive egalitarian schooling managed by a single agency” and access to schooling was dependent on one’s wealth, gender, and social status in the caste system, in Burma a system of monastic schooling that had a magnitude of independence already existed (Cheesman, 2003). This impeded the efforts of the British who had no means of unifying and reaching out to the hundreds of monastic schools that were not under a central authority. Additionally, the British failed to consider the problem of fluctuations and irregularities in school attendance that was prevalent in monastic schools. The disappointing results of trying to influence the Sangha and merge monastic education with western secular notions of schooling, the British administration changed their strategy. By 1871, the British authorities set up a system of lay schools under the control of a director of public instruction and his inspectors (Furnivall, 1948). Three main types of schools were established: vernacular schools, Anglo-vernacular schools, and English schools. These schools had taught the 3 Rs as well as subjects in science, British history, the British constitution, Grades 1 to 4 were designated as elementary school, grades 5 to 7 were designated as middle school and grades 8 to 10 as high school (Tinker, 1967). The language of instruction was Burmese in the vernacular schools and English in the English schools, while Anglo-Vernacular schools used both languages for instruction until the 8th standard and English becomes the sole language of instruction (Tinker, 1967). Students had to pay a fee to attend these schools and those who could not pay continued to attend monastic schools (Cheesman, 2003). Those who displayed high academic ability in vernacular schools were given financial aid and other “bridge” program provisions were made for them to transfer into Anglo-vernacular schools (Cambell, 1946). By 1891, there were over 6000 lay schools opened in Burma (Fuqua, 1992). The opening of the Rangoon University, the first higher education institution, in 1885 by the government was followed quickly by the opening of universities (Hillman, 1946). While the aim of the Sangha was to “teach the boys how to live but not merely how to make a living” (Furnivall, 1948), the modern schooling system based on western ideologies taught students skills that had market value and that led them to contribute to the economy to the benefit of their colonizers. Students were trained for vocational jobs or low skill jobs so that they could enter the work-force and help the British maximize their economic profits and the best of them attained higher education that allowed them to work in the colonial administration (Fuqua, 1992). The British education system did however have a positive effect on female education and increased female literacy because women were permitted to enroll in these lay schools (Furnivall, 19480). Later in the 1870s when the opening of the Suez Canal accelerated Burma’s economic growth which consequently led the administrative expansion, there was a rise in demand for English schools (Hillman, 1946). The majority of the schools that were opened were vernacular schools which only led to careers as vernacular school teachers or other low paying manual jobs. The Burmese began to realize that they needed to enroll in Anglo-Vernacular or English schools that would allow them attend university and secure jobs in the administration and other government office jobs in the education, health, forestry, and agricultural sectors (Tinker, 1967). As the number of students in Anglo-vernacular and English schools increased, so did the enrollment in universities, leading to a new class of educated Burmese citizens. The desire for social advantage led to the rise in demand and popularity of the state-managed modern education system and to the decline of the monastic school system. In the turn of the 20th century, the rise in the number of educated Burmese led to a nationalist movement that was inspired by a number of concurrent events. The reforms being implemented by the British in neighboring India and the Japanese victories against Russia opened up the possibility of successfully resisting their opp. Education received from the schooling system established by the British ironically contributed to the nationalist movement in two ways. First, while more people had earned higher degrees to enter government posts, most available posts for the Burmese had been filled by 1930. The frustration of university students was manifested in strikes and protests, contributing to the conditions of political unrest and economic decline in Burma (Hillman, 1946). In 1920, the university students began a national strike to protest against educational policies set by the British who raised the bar for university entrance requirements, marking the entry of students into national politics. Second, education empowered the Burmese people to fight for liberation from their western colonizers; the Burmese who had gone abroad for further studies returned with both a realization of how they had been second-class citizens in their own country that was being exploited by the colonizers as well as new ideas about government and politics (Cady, 1958). A revival of interest in Burmese history, arts, and literature followed John Furnivall’s organization of the Burma Research Society in 1909 (Cady, 1958). A nationalist group called the Young Men’s Buddhist Association (YMBA) that was modeled after the Young Men’s Christian Association began to organize and were later joined by other university student led groups such as the Thakin group and We Burmans Association They began to use print materials to mobilize nationalist sentiments across the nation (Cheesman, 2003). The agenda of these groups were centered largely on issues of education (Schober,2007). The Burmese began to realize that the knowledge of Burmese literature had almost died out and that aside from rural areas, English had become the main spoken language as Burmese language and literacy were not sufficiently taught in schools attended by the majority of students (Schober,2007). The YMBA based on its model and actions implicitly seemed to acknowledge that modernization was necessary and did not completely discard modern education. But at the same time, concerned about the influence of western education on the national identity, they tried to support schools that had Buddhism in the curriculum (Schober, 2007).The nationalists also supported monastic schools, petitioning the government to exempt these schools from taxation and discouraging costly religious rituals in these schools. In the 1920s, Burmese nationalists began to open private schools that were independent of government control that fostered nationalistic ideals (Hillman, 1946). Despite popular support, these schools did not have sufficient funding and had to receive government support (Hillman, 1946). The YMBA agitated the government further to establish more national schools that were independent from the British education system where Burmese was the language of instruction (Fuqua, 1992). Their aim was to establish a system that could compete with the British system and eventually supplant it (Fuqua, 1992). Please note that within the borders of Burma there exists a number of different ethnic minority groups who are identified separately from the main population of Burmans. In this paper, I am refer to the entire population that lives in Burma as “Burmese” and to those of the majority ethnic group as “Burmans”. Cady, John F. A History of Modern Burma. Ithaca, NY: Cornell UP, 1958. Print. Campbell, A. (1946). Education in Burma. Journal of the Royal Society of Arts, 49, 438-448. Furnivall, J. S. (1948). Colonial policy and practice a comparative study of Burma and Netherlands India,. Cambridge England: Cambridge University Press. Harvey, G. E. (1946). British Rule in Burma, 1824-1942. London: Faber and Faber. Octennial Report on Education in Burma, 1947-48 to 1954-55. (1956). Rangoon: Supdt., Govt. Printing and Staty., Union of Burma. Schober, J. (2007). Colonial knowledge and buddhist education in burma. I.Harris (Ed.) Buddhism, power, and political order (pp.52-70). London: Routledge. Tinker, H. (1967). The Union of Burma: a study of the first years of independence. (4th ed.). London: issued under the auspices of the Royal Institute of International Affairs by Oxford U.P. This rich historical essay asks a dual question about education and power: how did British colonialists transform Burmese education, and in turn, how did Burmese nationalists respond to foreign influences through schooling in the mid-19th to early 20th-centuries? The introductory thesis succinctly argues that the Brits sought to secularize schools to create civil servants and “civilize” the Burmese, while later nationalists reintroduced native literature and language through mass education. The body of the essay does an excellent job of drawing on a range of secondary sources that trace British attempts to westernize monastic schools, initial Burmese acceptance for social mobility into administrative occupations, followed by a subsequent nationalist movement that partly drew its strength from the new class of citizens that the British had educated. I encourage you to expand on this outstanding essay for your senior research project on Burmese teacher interviews (pending approval of the Ed 400 instructor), since it already has many of the qualities that I would expect from a published journal article in the field of educational history. Also, be sure to include captions with each image above to credit the source.